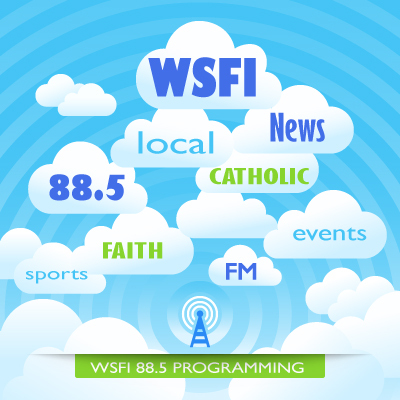 WSFI 88.5 FM offers programming and commentary relevant to Catholics worldwide. This is accomplished with balanced content that educates, inspires and informs listeners. These episodes were recorded in part on location at the National Shrine of St. Maximilian Kolbe at Marytown in Libertyville, IL. Mark Curran and Andy Bitto's Pre-Game Show and the live broadcast of the High School Game of the Week. WSFI Catholic Radio Presents important topics relating to men with host Brien Farely. Host Joe Scheidler discusses life and culture with pro-life guests. Reclaiming the Catholic Faith and its true teachings and traditions. Host Bill Snyder talks with special guests about Sports and Faith. Current Catholic Topics with host Deacon Greg Webster. Mike Fitzgibbons interviews a sports figure and talks about the issues of the day. A conversation with Catholics living in the light with special guests. With host Bill Snyder - performances and conversations with Christian musicians elevating the mind to things eternal. Deacon Frank De Frank, Ordained Permanent Deacon of the Archdiocese of Chicago talks about various Catholic Topics. Guy Murphy, host of Journey with Jesus takes listeners on a journey through scripture bringing to life the rich traditions of our Catholic life. USCCB presents tips and advice for married couples. WSFI Catholic Radio Station 88.5 FM presents local Parish Missions.